What makes these the best you ask? Fondue is my answer! I use the recipe for Hard Apple Cider Cheese Fondue for these amazing stuffed potatoes. What makes them so incredible is the extra-aged award winning Washington State University Cougar Gold Cheese that the cheese sauce is made from. I would swim with piranhas for Cougar Gold Cheese. Big, fat, toothless, vegetarian piranhas. Ok, so I’m a chicken, but seriously, this cheese is super fantastic. But if you can’t get a round of it, any good aged white cheddar will work well. 1. Microwave Method: Scrub the potatoes, pierce with a fork, and place on a paper towel in the microwave. Cook on high, flipping over every 5 minutes until easily pierced with a knife. Set aside. Oven Method: Preheat oven to 400 degrees, scrub potatoes, pierce with fork, rub with oil and place on the center rack of the oven. Place a foil lined baking sheet below to catch drips and bake for 45 minutes to an hour or until easily pierced with a fork. 2. Meanwhile, make the fondue and steam the broccoli. 3. Place the potatoes on individual plates. Cut with a sharp knife down the centers and squeeze potato together so the insides pop out a bit. Sprinkle with salt and pepper. Place the broccoli on top of the potatoes and spoon the cheese fondue on top. 4. Add the vinegar and stir together. Spoon over baked potatoes. Wow. I've never seen broccoli look so good. YUM! You could make a telephone book look appetizing. Now I'm hungry for baked potatoes with broccoli. What a lovely creation! Broccoli and potatoes! Yum! What a great way to use broccoli! I love the look of this. I want to eat that picture right off the screen! The Pacific Northwest is like Nirvana. I've got my eye on Portland, OR and I'll bet I can find this cheese there too without the toothless piranhas. That is one gorgeous looking dish. The colors are almost unreal and the recipe in intriguing. Very nice! This looks ever so good! I like the change to using a sharp white cheese and cider. I'm going to be on the hunt for Cougar Gold! Ooh, that sounds amazing! Your picture is gorgeous! Love this. Great meal idea! Hard cider fondue looks incredible! I don't know how you got the potato and broccoli to look so good, but you did! Looks amazing! I want to try it. I don't want to swim with man-eating fish though. I'm a big sissy. Wow... I love bake potatos, specially if cheese some how is involved. I have to make this ones for sure. How are you? Did you get my last email regarding Chelsea Market in the city? Big, fat, toothless, vegetarian piranhas - HAHA!! And I can actually use the microwave to cook the potatoes? Fantastic! I love broccoli - such a wonderful vegetable. 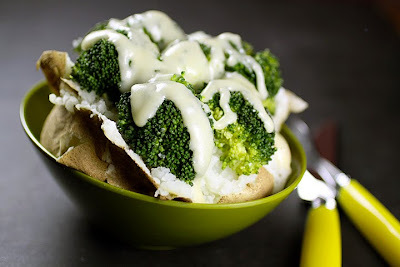 What a great idea for fondue, and I love baked potatoes with broccoli...and a little chili is nice too! Wow, I have never been drawn to broccoli in a potato until now! This looks delicious! I love everything about this dish including the photo! Bookmarked! Okay, this is one gorgeous dish. I love the heartiness of it...and the cider cheese fonduejust brings it over the top. Love your beautiful recipes! My husband just asked for me to make this next week--can't wait to blog about it! Wow! Love everything about this! But adding hard cider to a cheddar cheese fondue is magnificent! Make this for me when I visit? Please? We've never made fondue - I am super tempted with your description of this cougar gold cheese! Looks absolutely amazing! ciao! questi broccoli sono molto invitanti!! !